If you’ve tried running Facebook ads and think that they’re a waste of money, here’s a free tactic that you to try that can transform your experience. 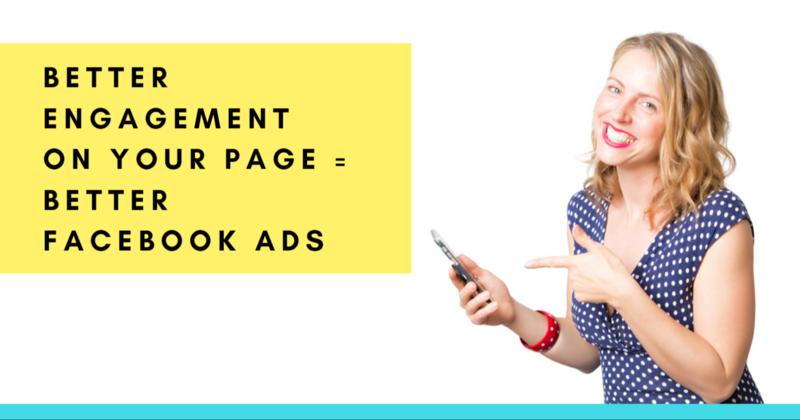 If you have a Facebook page where you never post anything and get low engagement it will affect how well your ads perform. You can’t just throw money at Facebook and hope it works. Check out this video about what you can do instead and then use the 10 steps to get you there faster! Have a brainstorming session where you think about commonly asked questions people ask you. Find somewhere with natural light and not too much sound interference to record. Wash your hair, put your make up on, choose a nice bright colour top – whatever makes you feel like you’ve got your game face on. Set up camera. Aka put your phone on something. Take a deep breath and hit record. Keep going until you’ve recorded all the videos from your list. Transfer files from your phone to your computer. I use my USB cord as they’re usually big files. Let me know if you’re going to change up anything on your Facebook page below. You actually need to be doing some other stuff in the background. Its not just all about putting money into Facebook and hoping that its going to turn into thousand if not millions of dollars. You can do this. You need to start getting over yourself. To run better Facebook ads you need to post quality content on your page. Not just sharing other people’s content but actually sharing native content on Facebook. So posting videos. Doing Facebook Lives. Where you talk about yourself as well. Or show people where you work, whether you work in a place where people come and see you. Or if your a consultant or naturopath, people can see the rooms with you consulting and the types of problems that you’ve solve for people. There’s so many things that you can do with video. And trust me if you start posting regularly on your page, with videos and Facebook lives. You’ll notice that when it comes to running Facebook ads. You’re actually going to pay less for your clicks, pay less for your leads, pay less for your post engagement. And the reason is Facebook goes… that person or that business is posting regularly and people finding a value. They are liking, commenting, and sharing the post. That means the ads must also be good. That means we’re gonna show their ads higher in the newsfeed. Show it to better types of people who will take those types of actions. You’ve got to really, not just expect the Facebook ads to do all the work. You need to remember that it’s a whole ecosystem. And definitely start posting on your Facebook page more and your ads will actually start running better. So get over yourself. Start running some more videos. And when it comes to running Facebook ads you’ll noticed that the cost will decrease. Helping business owners and marketers make sense of Facebook Ads to acheive better results.